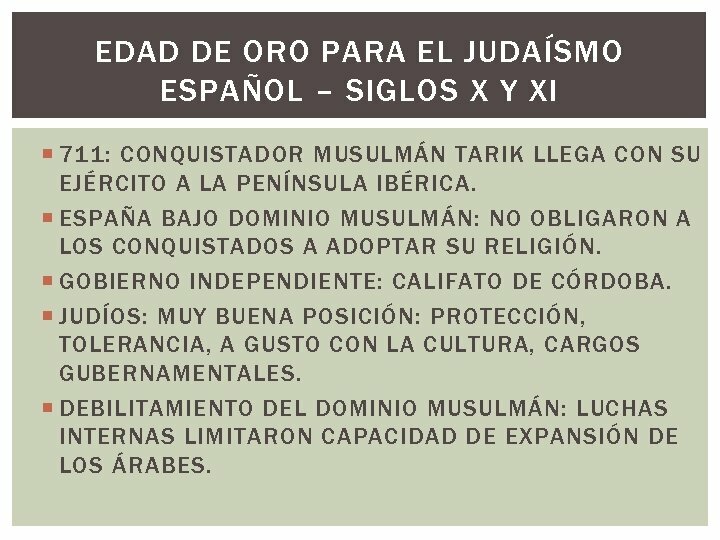 EDAD DE ORO PARA EL JUDAÍSMO ESPAÑOL – SIGLOS X Y XI 711: CONQUISTADOR MUSULMÁN TARIK LLEGA CON SU EJÉRCITO A LA PENÍNSULA IBÉRICA. ESPAÑA BAJO DOMINIO MUSULMÁN: NO OBLIGARON A LOS CONQUISTADOS A ADOPTAR SU RELIGIÓN. GOBIERNO INDEPENDIENTE: CALIFATO DE CÓRDOBA. JUDÍOS: MUY BUENA POSICIÓN: PROTECCIÓN, TOLERANCIA, A GUSTO CON LA CULTURA, CARGOS GUBERNAMENTALES. 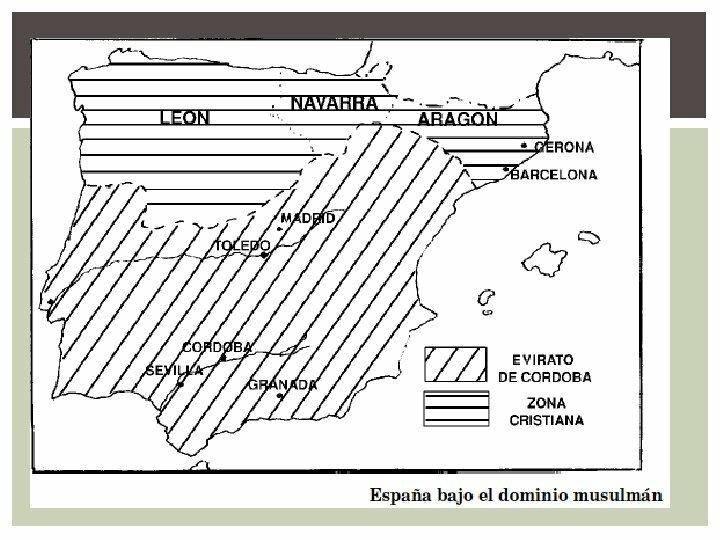 DEBILITAMIENTO DEL DOMINIO MUSULMÁN: LUCHAS INTERNAS LIMITARON CAPACIDAD DE EXPANSIÓN DE LOS ÁRABES. RECONQUISTA PROCESO QUE TERMINÓ CON EL PROLONGADO ASENTAMIENTO ISLÁMICO EN LA PENÍNSULA IBÉRICA. 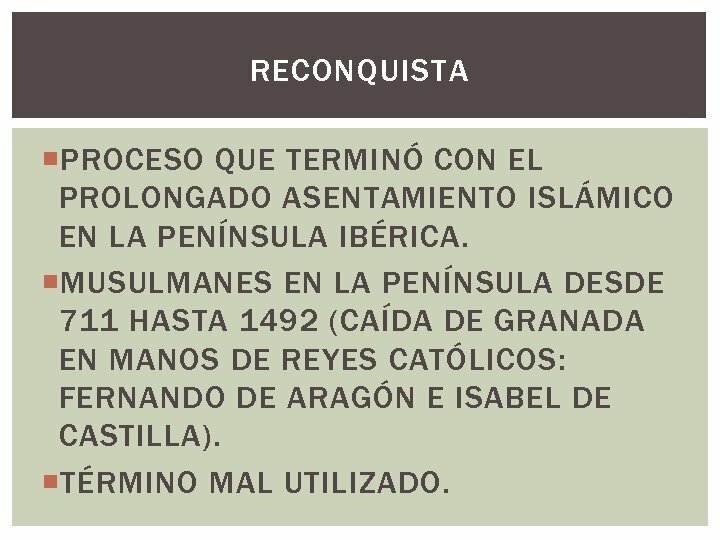 MUSULMANES EN LA PENÍNSULA DESDE 711 HASTA 1492 (CAÍDA DE GRANADA EN MANOS DE REYES CATÓLICOS: FERNANDO DE ARAGÓN E ISABEL DE CASTILLA). TÉRMINO MAL UTILIZADO. 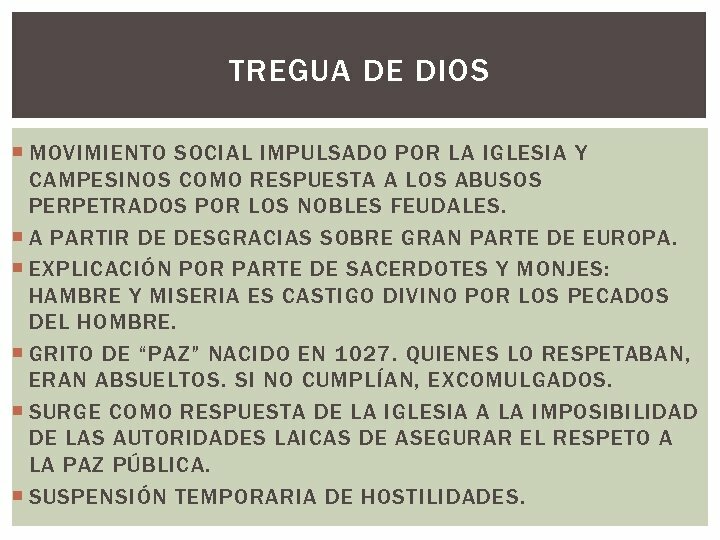 TREGUA DE DIOS MOVIMIENTO SOCIAL IMPULSADO POR LA IGLESIA Y CAMPESINOS COMO RESPUESTA A LOS ABUSOS PERPETRADOS POR LOS NOBLES FEUDALES. A PARTIR DE DESGRACIAS SOBRE GRAN PARTE DE EUROPA. EXPLICACIÓN POR PARTE DE SACERDOTES Y MONJES: HAMBRE Y MISERIA ES CASTIGO DIVINO POR LOS PECADOS DEL HOMBRE. GRITO DE “PAZ” NACIDO EN 1027. QUIENES LO RESPETABAN, ERAN ABSUELTOS. SI NO CUMPLÍAN, EXCOMULGADOS. SURGE COMO RESPUESTA DE LA IGLESIA A LA IMPOSIBILIDAD DE LAS AUTORIDADES LAICAS DE ASEGURAR EL RESPETO A LA PAZ PÚBLICA. SUSPENSIÓN TEMPORARIA DE HOSTILIDADES. 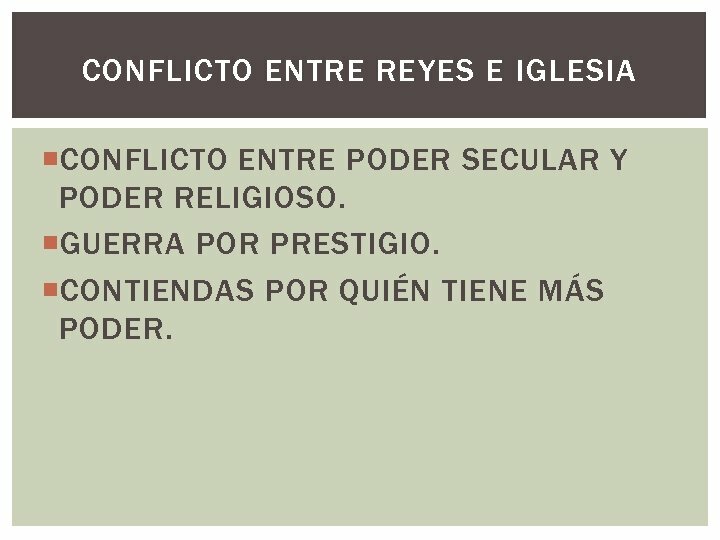 CONFLICTO ENTRE REYES E IGLESIA CONFLICTO ENTRE PODER SECULAR Y PODER RELIGIOSO. GUERRA POR PRESTIGIO. CONTIENDAS POR QUIÉN TIENE MÁS PODER. 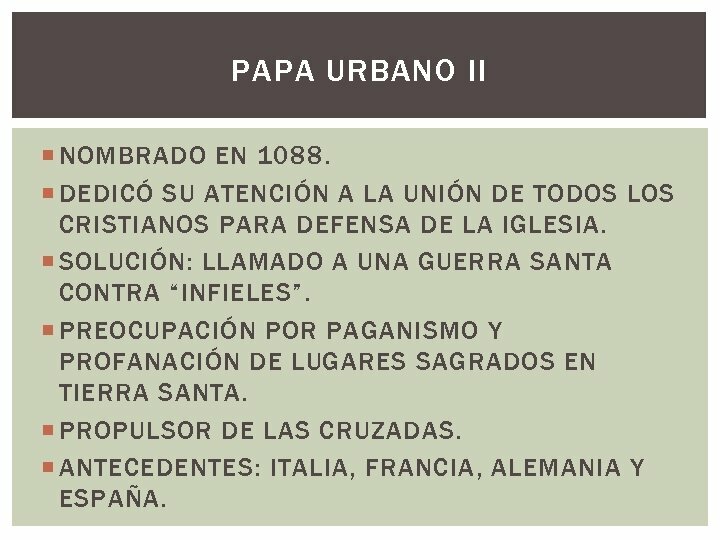 PAPA URBANO II NOMBRADO EN 1088. DEDICÓ SU ATENCIÓN A LA UNIÓN DE TODOS LOS CRISTIANOS PARA DEFENSA DE LA IGLESIA. SOLUCIÓN: LLAMADO A UNA GUERRA SANTA CONTRA “INFIELES”. PREOCUPACIÓN POR PAGANISMO Y PROFANACIÓN DE LUGARES SAGRADOS EN TIERRA SANTA. PROPULSOR DE LAS CRUZADAS. 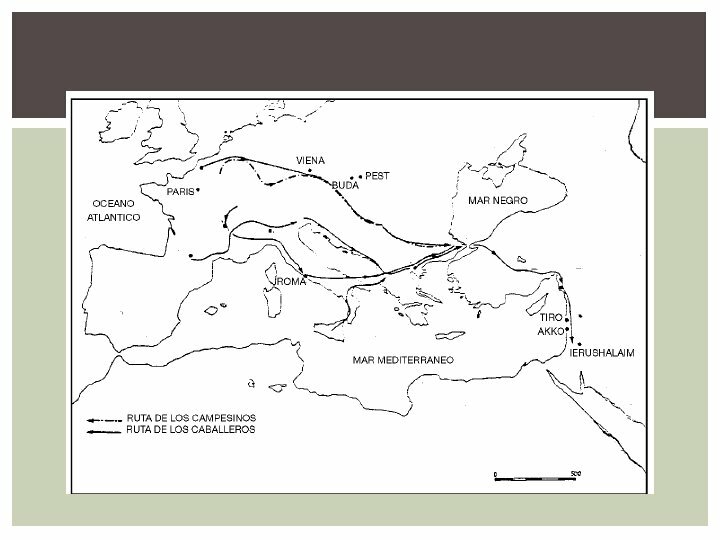 ANTECEDENTES: ITALIA, FRANCIA, ALEMANIA Y ESPAÑA. 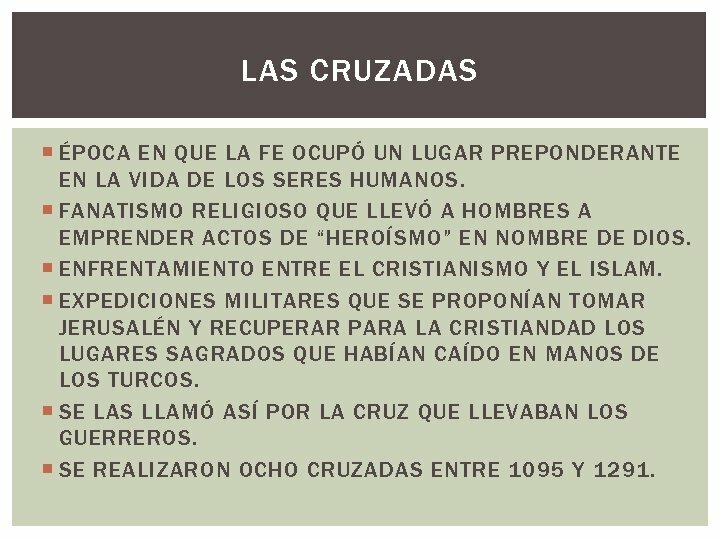 LAS CRUZADAS ÉPOCA EN QUE LA FE OCUPÓ UN LUGAR PREPONDERANTE EN LA VIDA DE LOS SERES HUMANOS. 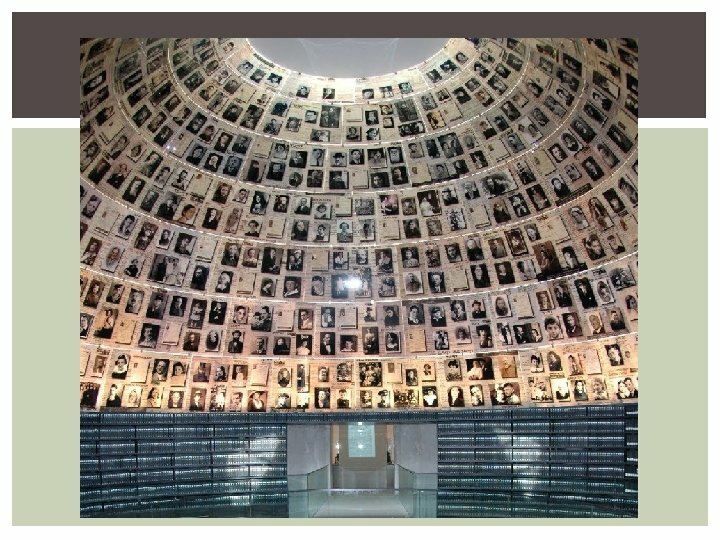 FANATISMO RELIGIOSO QUE LLEVÓ A HOMBRES A EMPRENDER ACTOS DE “HEROÍSMO” EN NOMBRE DE DIOS. ENFRENTAMIENTO ENTRE EL CRISTIANISMO Y EL ISLAM. 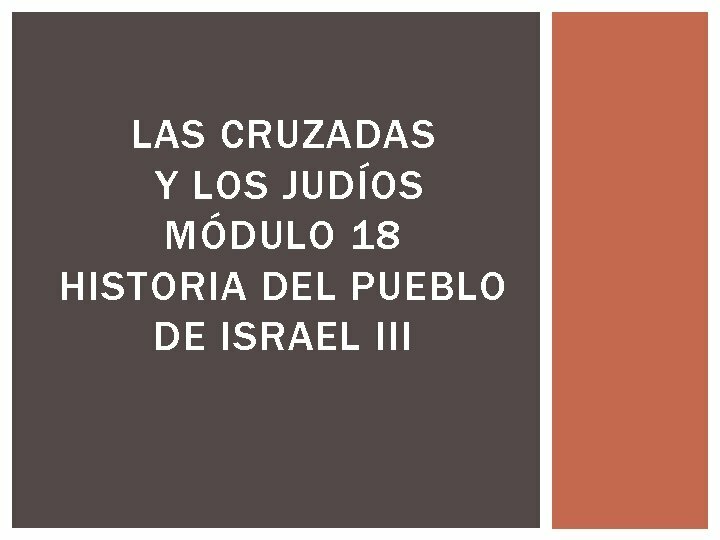 EXPEDICIONES MILITARES QUE SE PROPONÍAN TOMAR JERUSALÉN Y RECUPERAR PARA LA CRISTIANDAD LOS LUGARES SAGRADOS QUE HABÍAN CAÍDO EN MANOS DE LOS TURCOS. SE LAS LLAMÓ ASÍ POR LA CRUZ QUE LLEVABAN LOS GUERREROS. SE REALIZARON OCHO CRUZADAS ENTRE 1095 Y 1291. OBJETIVOS DE LAS DISTINTAS CLASES ALTO CLERO: DESVIAR LOS ATAQUES DIRIGIDOS AL PAPADO QUE AMENAZABAN LA SEGURIDAD DE LA IGLESIA. UNIR A TODOS LOS CRISTIANOS. PREOCUPACIÓN POR LAS CONTIENDAS ENTRE IGLESIA Y SEÑORES FEUDALES. BAJO CLERO: GUIAR A LAS MASAS A LA LIBERACIÓN DEL SANTO SEPULCRO. BÚSQUEDA DE UNIÓN DE LOS CRISTIANOS. NOBLEZA: CONQUISTA DE NUEVOS TERRITORIOS. SISTEMA AGRÍCOLA FEUDAL SE ESTABA AGOTANDO. COMERCIANTES: AMPLIACIÓN DE MERCADOS. CAMPESINOS: LIBERARSE DE LA ESCLAVITUD Y OPRESIÓN. OPORTUNIDAD DE HAZAÑAS Y AVENTURAS. 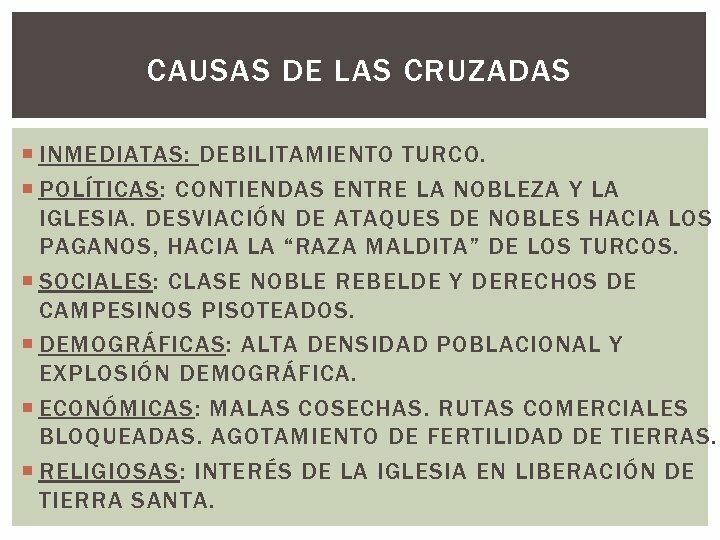 CAUSAS DE LAS CRUZADAS INMEDIATAS: DEBILITAMIENTO TURCO. POLÍTICAS: CONTIENDAS ENTRE LA NOBLEZA Y LA IGLESIA. DESVIACIÓN DE ATAQUES DE NOBLES HACIA LOS PAGANOS, HACIA LA “RAZA MALDITA” DE LOS TURCOS. 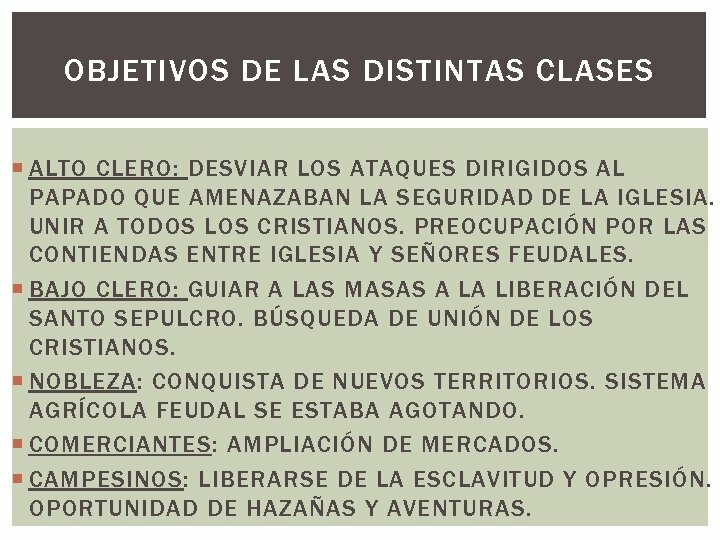 SOCIALES: CLASE NOBLE REBELDE Y DERECHOS DE CAMPESINOS PISOTEADOS. DEMOGRÁFICAS: ALTA DENSIDAD POBLACIONAL Y EXPLOSIÓN DEMOGRÁFICA. ECONÓMICAS: MALAS COSECHAS. RUTAS COMERCIALES BLOQUEADAS. AGOTAMIENTO DE FERTILIDAD DE TIERRAS. RELIGIOSAS: INTERÉS DE LA IGLESIA EN LIBERACIÓN DE TIERRA SANTA. 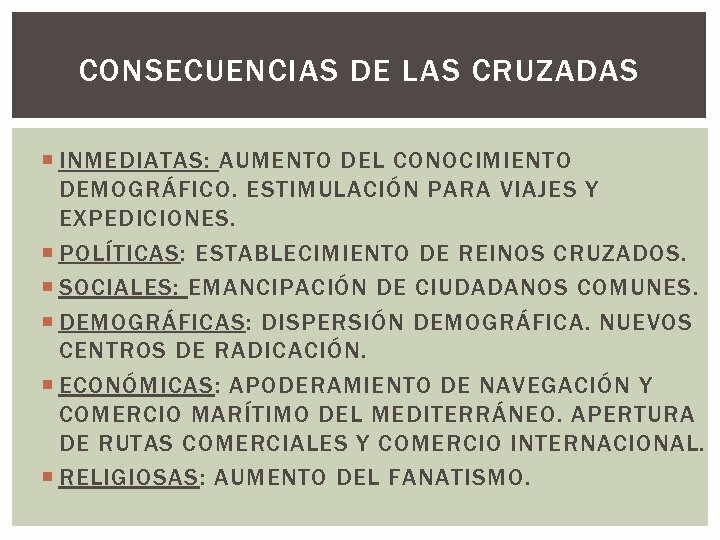 CONSECUENCIAS DE LAS CRUZADAS INMEDIATAS: AUMENTO DEL CONOCIMIENTO DEMOGRÁFICO. ESTIMULACIÓN PARA VIAJES Y EXPEDICIONES. POLÍTICAS: ESTABLECIMIENTO DE REINOS CRUZADOS. SOCIALES: EMANCIPACIÓN DE CIUDADANOS COMUNES. DEMOGRÁFICAS: DISPERSIÓN DEMOGRÁFICA. NUEVOS CENTROS DE RADICACIÓN. ECONÓMICAS: APODERAMIENTO DE NAVEGACIÓN Y COMERCIO MARÍTIMO DEL MEDITERRÁNEO. APERTURA DE RUTAS COMERCIALES Y COMERCIO INTERNACIONAL. RELIGIOSAS: AUMENTO DEL FANATISMO. 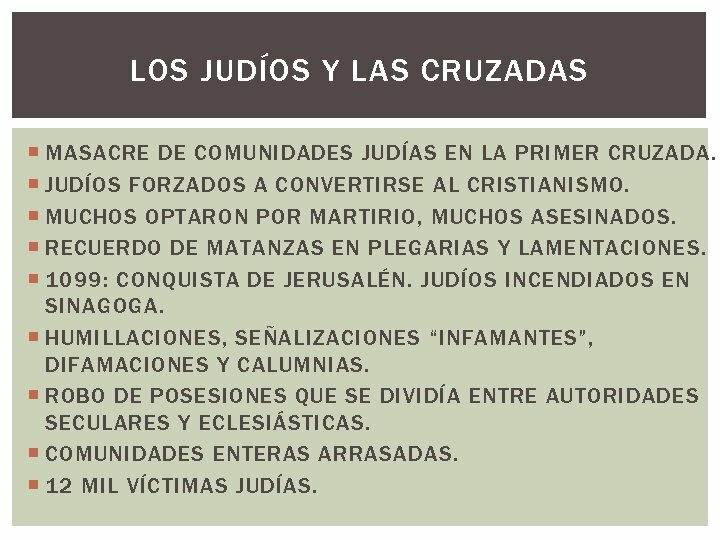 LOS JUDÍOS Y LAS CRUZADAS MASACRE DE COMUNIDADES JUDÍAS EN LA PRIMER CRUZADA. JUDÍOS FORZADOS A CONVERTIRSE AL CRISTIANISMO. MUCHOS OPTARON POR MARTIRIO, MUCHOS ASESINADOS. RECUERDO DE MATANZAS EN PLEGARIAS Y LAMENTACIONES. 1099: CONQUISTA DE JERUSALÉN. JUDÍOS INCENDIADOS EN SINAGOGA. HUMILLACIONES, SEÑALIZACIONES “INFAMANTES”, DIFAMACIONES Y CALUMNIAS. ROBO DE POSESIONES QUE SE DIVIDÍA ENTRE AUTORIDADES SECULARES Y ECLESIÁSTICAS. COMUNIDADES ENTERAS ARRASADAS. 12 MIL VÍCTIMAS JUDÍAS. 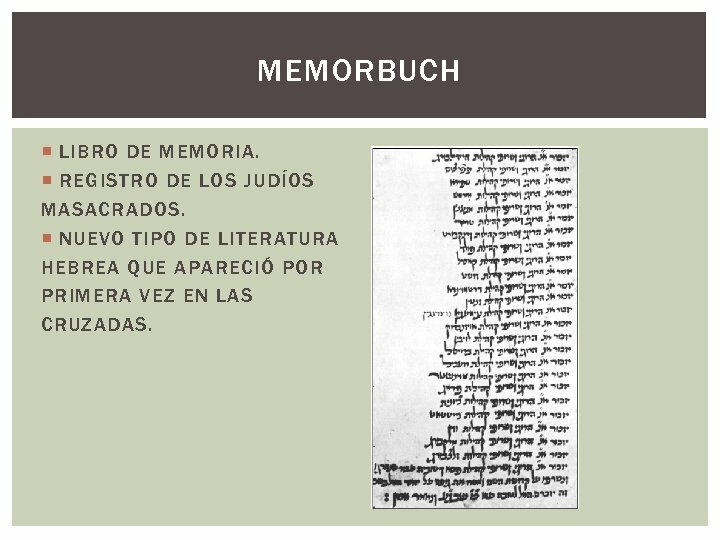 MEMORBUCH LIBRO DE MEMORIA. REGISTRO DE LOS JUDÍOS MASACRADOS. NUEVO TIPO DE LITERATURA HEBREA QUE APARECIÓ POR PRIMERA VEZ EN LAS CRUZADAS.